Treatment strategies for foot infections have been changing and evolving as a result of pharmacologic and technical breakthroughs. Plastic and reconstructive techniques for limb salvage have altered the course of treatment for foot infections, with the goals of functional restoration and a major decrease in amputation rates. Physicians need to be aware of the many different types of foot infections that exist. Some foot infections are very simple, but others are quite complex, and no two are exactly alike. They are categorized into three groups: soft-tissue foot infections, bone infections in the foot, and diabetic foot infections. Foot infections in diabetic patients can be unpredictable and are typically polymicrobial. Soft-tissue infections in the foot consist of any infectious process affecting the skin, subcutaneous tissue, adipose tissue, superficial or deep fascia, ligaments, tendons, tendon sheaths, joints, or joint capsules. Considering that there are more than 20 joints, 44 tendons, approximately 100 ligaments, four major compartments, and numerous fascial planes in the normal foot, one can readily appreciate the potential for complex problems. Many events can be responsible for these soft-tissue infections. A description of soft-tissue infections includes simple, moderate, and severe infections, which includes but is not limited to the immunocompromised patient, infections associated with PVD, emergency soft-tissue infections, and infections associated with trauma. Given the limited soft-tissue envelope, it is common for bone to be involved when an infectious process is present in the foot. Diabetes mellitus (DM) has been diagnosed in approximately 26 million US citizens. (See Diabetic Foot Infections, below.) It can produce a complex clinical picture because of its involvement in numerous different organ systems. The coexisting diabetic peripheral neuropathy and compromised distal vascularity act synergistically, putting these patients at high risk for pedal complications. Individuals with diabetes tend to develop ulcerations in the feet, which often lead to infection of the soft tissue and bones. Infected ulceration plantar to fifth metatarsal head. This ulceration could be probed to bone, and deep-space infection was present. Patient was taken to surgery for drainage of underlying abscess. Cellulitis completely resolved less than 24 hours postoperatively. The clinical presentation for cellulitis typically includes blanching erythema in the skin that is generally bright red and angry. On examination, a break in the skin is usually present; however, patients with venous stasis or lymphatic disease can develop cellulitis with no apparent tissue loss. Increased temperature relative to the contralateral foot and leg is often noted. Dependent rubor, observed in patients with peripheral vascular disease (PVD), and gout are the two differential diagnoses most commonly mistaken for cellulitis in the foot. However, in neuropathic patients with loss of protective sensation (eg, diabetics), Charcot arthropathy should be included in the differential diagnosis early; it is often difficult to differentiate the rubor of Charcot from the rubor of cellulitis, and the two conditions can coexist. Complications include lymphadenitis and contiguous inoculation to adjacent osseous structures, joints, deep structures, or tissue planes. Group A streptococci are the most common pathogens and are usually susceptible to penicillin V and cephalexin. In more severe cases, oxacillin (2 g IV q4hr) or cefazolin (1 g IV q8hr) can be used. Cellulitis usually responds well to antibiotics, rest, and elevation of the extremity. In more severe cases where septic embolization occurs, invasive treatment with debridement of necrotic tissue becomes necessary. In complex cases, early consultation with infectious disease specialists is highly recommended. Onychocryptosis with paronychia of medial and lateral nail folds. Treatment consists of oral antibiotic therapy and removal of involved nail borders. Nail borders puncture skin and act as foreign bodies. These must be removed in order for infection to completely resolve. Onychocryptosis in 13-year-old boy that has gone untreated for several months. Removal of ingrown nail has not resolved infection in this case, because underlying osteomyelitis has developed. Note remaining erythema and edema of hallux. Osteomyelitis of the distal phalanx secondary to untreated onychocryptosis. This ia rare situation demonstrates importance of prompt treatment. Patient underwent partial hallux amputation. Initial treatment should include antibiotic therapy and warm soaks to the affected digit. Antibiotic therapy should be directed toward the offending pathogens, which commonly derive from the skin flora. When onychocryptosis is the underlying etiology, that portion of the nail should be removed to address the soft-tissue reaction. A partial nail avulsion involves removing the border of the ingrown nail. Chronic recurrent paronychias can be treated with a chemical matrixectomy or via local surgical excision. Puncture wounds occur more than 50% of the time on the plantar surface of the foot, with more than 90% of these involving penetration by a nail. Other objects in this category include wood, metal, plastic, glass, and bites from animals or humans. Puncture wounds can lead to serious complications by inoculating deep spaces of the foot, including bones, joints, tendons, and deep fascia. Therefore, the depth of penetration is one of the most important factors in determining whether a wound will resolve without complex intervention. Degree of infection can depend on location, type of penetrating object, retained foreign bodies, and penetration through shoes and socks. Signs of erythema, edema, and pain at the site of injury usually suggest that an infectious process has begun. The most common presenting complaint in the emergency department (ED) is persistent pain. A complete history can aid in determining the age of the wound in addition to the mechanism, type of contamination, and possibility of retained foreign body. Pain out of proportion to the injury strongly indicates that an infection has developed. Inoculation into a joint can lead to septic arthritis with rapid destruction of the articular structures. P aeruginosa is the most common pathogen associated with osteochondritis following puncture wounds in the foot. Foreign body penetration into bone can lead to direct extension osteomyelitis. If the wound can be probed directly to bone or joint capsule, deep inoculation is more likely, and the wound should be explored and debrided in surgery. Diagnostic imaging is indicated for all puncture wounds. [14, 15] When foreign bodies become lodged within the foot, they need to be removed. If the object is visible or readily accessible through the wound, an attempt can be made in the ED to retrieve it. If the object is deeply imbedded, it should be addressed in surgery and retrieved under fluoroscopic guidance. Deep penetrating injuries should be debrided to remove all contaminants and nonviable tissue. Superficial wounds can be irrigated with saline either in the ED or the physician's office. Drains are often helpful for deep penetrating wounds in addition to open or closed systems. Empiric antibiotic therapy should be directed toward the suspected pathogen, with S aureus being the most common bacterial contaminant. A complete history aids in antibiotic choice against other pathogens (eg, P multocida, P aeruginosa, viridans streptococci). 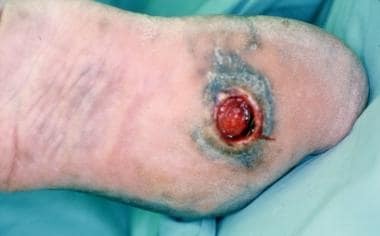 Puncture wounds that occur in a contaminated environment, such as farms and industrial areas, can result in polymicrobial infections, which include gram-negative and anaerobic bacteremia. Deep wound cultures and sensitivities help guide the antibiotic choice. Superficial infections usually can be treated adequately with oral antibiotics. Deep wounds or those with suspected bone and joint involvement should include intravenous therapy and appropriate surgical debridement. Pedal infections in patients who are immunocompromised can be difficult to diagnose and treat because of comorbidities, which often alter the presentation and require treatment. This group of patients includes persons with HIV, systemic lupus erythematosus (SLE), rheumatoid arthritis (RA) and high-dose corticosteroid use, DM, and asplenia. These patients can have impaired host defenses and are at higher risk for acquiring infections. Patients with HIV are more susceptible to fungal and viral pedal infections. Tinea pedis and onychomycosis are often observed in this population. Human papillomavirus (HPV), manifesting itself as verruca plantaris, occurs at a higher rate than in the non-HIV population. Fungal infections usually can be managed with a variety of antifungal creams. Verrucae can be more challenging to treat. The condition often requires several modalities for complete resolution. Common therapies include salicylic acid application, cryotherapy, blistering agents, and surgical excision. Individuals with SLE are predisposed to infection by virtue of their impaired humoral immunity and lowered T-lymphocyte–mediated immunity, which results from immunosuppressive therapy. Lupus flares can be mistaken for an infection, and the differential diagnosis must be evaluated carefully. SLE skin and soft-tissue infections most commonly are caused by S aureus and less commonly by group A streptococci. The absence of a true leukocytosis may create a confusing environment for the diagnostician. Patients with systemic arthropathies such as RA are often on long-term corticosteroid therapy, which suppresses cell-mediated immunity and puts them at higher risk for infection. Classic presentations include synovitis, pannus formation, and periarticular bone and cartilage destruction. These local manifestations of systemic disease can be confused with soft-tissue infection. Approximately 20% of patients with RA have rheumatoid nodules. They frequently occur over pressure areas in the foot, which can rupture, causing skin breakdown, erythema, and infection. Therefore, patients with RA presenting with possible pedal infections require a thorough workup to exclude the conditions discussed above. Persons with DM are truly compromised as a consequence of their impaired host defenses, decreased perfusion to the lower extremities, and diminished protective sensation in the feet secondary to peripheral neuropathy. This group of patients is very challenging to treat (see Diabetic Foot Infections, below). The spleen is the primary site for immunoglobulin M (IgM) synthesis. This places patients with asplenia at higher risk for all infections. They are at a particular high risk for infection with encapsulated bacterial organisms. It is important to determine if they have joint implants or internal fixation in the feet because of the organisms' affinity for seeding these areas. For fractures requiring open reduction and external fixation (ORIF), prophylaxis against these pathogens is appropriate. Typical pedal infections in these patients are clinically indistinguishable from those in healthy hosts, except that they are often more severe. Judicious and early consultation of infectious disease specialists is highly recommended. Antibiotic coverage should be directed toward the encapsulated pathogens and consist of third- or fourth-generation cephalosporins. Imipenem should be used in the patient who is allergic to penicillin. If hardware is present and has become colonized, it should be removed for complete resolution of the infection. The poorly perfused or ischemic foot is prone to more frequent and severe infections as a consequence of low oxygen tension. The inflammatory response to stress can be impaired. Decreased local perfusion, edema formation, and neutrophil infiltration are present. Small abrasions in these patients can become quite problematic because they do not have sufficient blood supply to heal properly. Prolonged healing time leaves the patient more susceptible to infection and complications. Ischemic feet are also prone to ischemic-type ulcerations that have an extended healing time and an increased chance of infection. 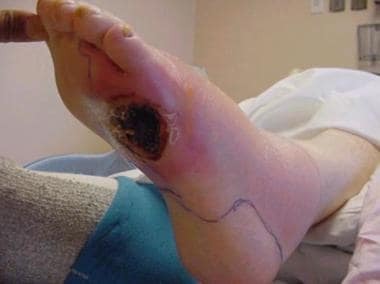 The evaluation of a patient with PVD presenting with an apparent foot infection can be quite challenging, and one must distinguish dependent rubor from cellulitis (see the image below). Dependent rubor is very common in this group and consists of an erythematous foot while dependent, which closely mimics cellulitis. They differ clinically in that dependent rubor does not have increased temperature, can be bilateral, and, most importantly, completely resolves with elevation of the extremity. Therefore, when a patient presents with absent pedal pulses or known PVD and has apparent cellulitis in the foot, the leg should be elevated to observe if the erythema subsides. Dependent rubor in lower extremity of patient with peripheral vascular disease. This condition can mimic cellulitis, which must be excluded during physical examination. Erythema completely resolves when extremity is elevated. Injured tissue in the critically ischemic foot can proceed to gangrene because the metabolic requirements to heal the wound are much greater than those needed to maintain normal tissue viability. This event is typically not an emergency and is described as dry gangrene (see the image below). Clinically, the lesion is dry and stable with no local or systemic signs of infection. A small amount of erythema around the demarcation line may be present between healthy and nonviable tissue, and again, dependent rubor must be ruled out. If this wound remains stable and does not become grossly infected, allowing the digit to auto-amputate is often the management of choice. Dry gangrene of digits 1-5. Digits are stable and have no signs of infection. Note line of demarcation between healthy and nonviable tissue. Treatment options include autoamputation and surgical amputation. This does not represent urgent surgical situation unless it becomes infected. Conversely, gas gangrene is an emergency, and its pathophysiology differs from that of dry gangrene. It has a wet appearance, and the patient usually has local and systemic signs of infections requiring surgical debridement (see the image below). Wet gangrene is surgical emergency. Intraoperative photo was taken after irrigation and debridement with partial first-ray resection. Note healthy tissue margins and high level of perfusion once necrotic tissue has been removed. Antibiotic therapy should be directed toward the offending organisms. Ischemic tissues may not respond to antibiotics and therefore may require debridement (often aggressive). In managing deep-space infections, debridement in surgery is the only option for infection control. Superficial wound infections not probing to deep structures can respond to topical dressings and antibiotic therapy. Treatment includes aggressive debridement of all nonviable tissue, administration of systemic antibiotics, and application of topical antimicrobial agents. Silver sulfadiazine cream 1% remains one of the more popular topical agent because of its effectiveness in controlling P aeruginosa, as well as many other wound pathogens. Once wounds are stable, coverage of the area should be sought using synthetic skin equivalents, porcine xenografts, allografts, or autografts. Degloving injuries result from a shearing force on the skin, which causes it to be undermined and elevated through the subcutaneous plane. A flap of tissue is created with a margin remaining intact or becoming completely avulsed. This represents a potentially serious situation that can lead to significant infection. Initial treatment consists of high-pressure irrigation and debridement of all necrotic tissue. The soft-tissue defect is similar to a burn wound; thus, common pathogens can be expected. Because these wounds on the feet typically occur in contaminated environments such as motor vehicle accidents or farm-type injuries, anaerobic pathogens also should be expected. As with burn injuries, topical and systemic antibiotics should be administered. If a tissue flap remains intact, it is replaced over the wound without tension and allowed to demarcate. Once the margins are defined, the nonviable tissue is debrided, and plans for final reconstruction using split-thickness skin graft or flap coverage are initiated. Crush injuries are common with foot trauma, especially in industrial settings. The widespread use of safety boots has decreased the incidence and severity of these injuries, but they still occur on a regular basis. The degree of injury can include mild contusions, skin lacerations, fractures, disruption of vascular supply, or combinations thereof. Crush injuries to the digits commonly include a nail-bed laceration with fracture of the underlying phalanx. These are treated as open fractures with irrigation, local wound care, tetanus prophylaxis, and antibiotics. Industrial settings generally are contaminated; therefore, surgical debridement and delayed closure should be considered. Gunshot wounds generally are described as being of either low or high velocity. The speed at which the bullet is traveling as it exits the barrel or enters the body determines which group it is classified under; it also serves as an indicator for the amount of damage induced by the projectile, with low velocity yielding relatively more benign injuries. Handguns, which typically use low-velocity ammunition, cause most civilian gunshot wounds. All gunshot wounds are contaminated with bacteria. The old myth that a bullet becomes sterilized by the high temperatures reached in the barrel is false. The newly inoculated bacteria multiply in proportion to the amount of devitalized tissue. The tissue surrounding the bullet path becomes devitalized with compromised blood flow. It takes a few days for new capillaries to grow into the disrupted area. The interim period of decreased blood results in poor delivery of antibiotics to necrotic regions. Early debridement and intravenous (IV) antibiotics are the recommended treatments of choice. All nonviable tissue should be debrided, and the original wound should be left open for 4-7 days. The wound is debrided as often as needed and finally is closed by delayed primary closure. All periwound erythema and edema must be resolved prior to reconstruction. Upward of 60,000 lawn mower injuries occur annually in the United States, most of them involving the lower extremities. Injuries can range from simple lacerations to more severe fractures and amputations. Because the setting for these injuries is inherently dirty, a wide variety of pathogens will be present. The combination of pathogens and severity of injury leads to a prolonged and expensive treatment course with an estimated annual cost of $475 million. A good history is important for determining the mechanism of injury, the setting in which the injury occurred, and tetanus status. The injuries often occur after patients fall off or are struck by a riding mower; thus, lesions away from the lower extremity also must be excluded on examination. Lacerations should be inspected in depth to ensure that all tendon, bone, and neurovascular structures are intact. These can easily be compromised because of their superficial nature. In addition to antibiotic therapy, the patient is taken to the operating room for irrigation and debridement. The grass, water, dirt, and debris that frequently contaminate these wounds are removed, and all nonviable tissue is excised. As with most contaminated wounds, these are left open and packed until the wound converts to healthy tissue. Several staged debridements are commonly needed before the damaged limb is definitively reconstructed. Surgical wounds and infections resulting from IV drug abuse or "skin popping" can also lead to necrotizing infections. Aerobic streptococci are typical pathogens in addition to Bacteroides species, staphylococci, and enterococci, which all play a role in the infectious process. E coli and Proteus species are facultative anaerobic gram-negative rods that often are cultured from these wounds. Patients usually present with nonspecific inflammatory signs of pain, swelling, and erythema. Crepitus in the soft tissue is almost diagnostic for this condition but is not always present at the initial presentation. Blistering of the skin and soft-tissue gas on radiographic examination are also highly indicative. The average time from onset of symptoms until the patient is observed in the ED is 4 days. 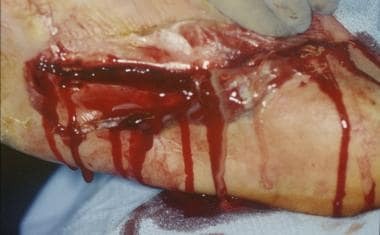 The keys to successful management of necrotizing fasciitis and associated low mortality are early diagnosis, broad-spectrum antibiotics, appropriate medical management, and prompt surgical intervention, which often involves multiple debridements. Antibiotics must be broad-spectrum to cover polymicrobial flora. Piperacillin-tazobactam and ticarcillin-clavulanate are used frequently and are very effective. Combination therapy with an antipseudomonal, a third-generation cephalosporin, and clindamycin is also indicated. Aggressive debridement is mandatory to control local factors such as tissue necrosis and anaerobic bacterial overgrowth. Gas gangrene (clostridial myonecrosis) is considered a surgical emergency (see the images below). It includes a rapid fulminating course, severe toxin-related systemic toxicity, a vast level of tissue destruction, and a high mortality. Rapid diagnosis and aggressive management are for limb preservation. 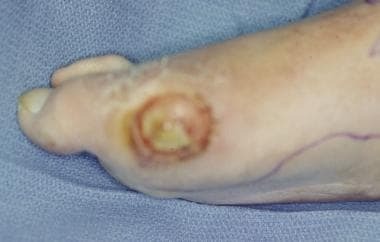 Gangrene with underlying deep-space infection. "Milking" wound produced purulent exudate from the abscess. Early wet gangrene of hallux. Early wet gangrene of hallux. This began secondary to embolic event with showering to hallux. Patient has history of peripheral vascular disease and previously lost her fourth toe because of it. Six different species of Clostridium can be responsible for the soft-tissue destruction; however, Clostridium perfringens is the most common. C perfringens produces 12 active tissue toxins responsible for the syndromes of gas gangrene. Clostridia are saprophytes and are quite ubiquitous. Infections leading to gas gangrene require an opportunistic environment. Prerequisites include a wound, contamination with clostridia, and a depressed oxygen state at the site of inoculation. This accounts for the increased incidence of gangrene noted in diabetics and patients with PVD. A decreased oxygen state also can be observed postoperatively from local edema and tight dressings. Typical onset can be 12-24 hours but can be as short as 6 hours; thus, a high initial index of suspicion is necessary. Excruciating progressive muscular pain is the first and most important symptom. Systemic findings are more frequent and severe than in individuals with necrotizing fasciitis. Diaphoresis, low-grade fevers, tachycardia, and mental status changes are often observed with this population. Successful management includes high-dose IV antibiotic therapy with aggressive surgical debridement. The antibiotic of choice is penicillin G 10-12 million U/day. Chloramphenicol, 4 g/day, can be used in patients who have a penicillin allergy. Surgical debridement is performed on an emergency basis and confirms the diagnosis suspected clinically when necrotic muscle is found beyond the area of trauma. Multiple debridements are performed every 24-48 hours, often requiring fasciotomies and/or amputations. Normal adult anatomy of the foot includes 26 bones and two sesamoids. The foot can be divided into tarsal bones, metatarsals (MTs), and phalanges. The greater tarsus, or hindfoot, comprises the calcaneus and talus. The lesser tarsus, or midfoot, includes the cuboid, navicular, medial cuneiform, intermediate cuneiform, and lateral cuneiform. Five MTs and 14 phalanges constitute the forefoot. Osteomyelitis is relatively common, especially in conjunction with other infectious processes in the foot. The typically thin soft tissue layer and close proximity to the outside environment place an individual at risk for direct inoculation via puncture wounds and spread from overlying soft tissue infection. The classic route of hematogenous spread is not common in the foot. Direct-extension osteomyelitis is typical in the diabetic population. Treatment for pedal osteomyelitis can involve 6-8 weeks of intravenous (IV) antibiotics. However, surgical debridement with combined antibiotic therapy is the treatment of choice and often lowers the time of antibiotic therapy to 2-4 weeks. Hematogenous spread of infection is one of the three classic routes of bone contamination and is the most common means of acquiring osteomyelitis in the skeletally immature patient. The other two forms are contiguous spread and direct implantation. Hematogenous osteomyelitis is uncommon in the foot. Patterns of infection differ for children and adults. Vascular anatomy of the undeveloped osseous structures determines the extent and involvement of bone infection. Neonates have diaphyseal vessels that can penetrate growth plates, creating a vascular connection with the epiphysis, which allows for spread of infection. Epiphyseal infections are common in neonates for this reason. Metaphyseal capillaries in children older than 1 year do not cross the physis but often create sinusoidal lakes in the metaphysis. This predisposes them for infection in the metaphyseal bone. They also demonstrate a 25% incidence of hematogenous spread to nontubular bones, often involving the calcaneus. The closure of the growth plates in adults results in a vascular connection between the metaphysis and epiphysis and is once again established. Therefore, adults are at higher risk for joint contamination; however, tubular bone involvement is not observed very often. Hematogenous spread in adults occurs in the spine, pelvis, and, to less of an extent, the small irregular bones of the foot. Acute osteomyelitis results causes inflammation within the bone, leading to edema, cellular infiltration, and eventual abscess formation. The increased pressure allows organisms to spread into cortical bone and eventually into the subperiosteal space. Elevation of the periosteum and subsequent lying down of new bone creates an involucrum, which is often the first sign of osteomyelitis on radiographic examination. It is generally more pronounced in neonates and children because of the looser attachment of the periosteum. Conversely, sinus tracts are more common in adults with abscess formation in adjacent soft tissues. The progression of cortical osteolysis in the tubular bones of the foot can lead to stress risers and pathologic fractures. Radiographs in this group, especially in children, are not specific and can mimic a variety of malignant bone tumors, which need to be evaluated further. Contiguous spread of infection involves contamination from the soft tissue inward toward bone. The method of inoculation differs from hematogenous spread. Microbes invade the periosteum, causing disruption of the cortex and dissemination into bone marrow. Direct-extension osteomyelitis is the most common form of bone infection in the foot, and the diabetic population accounts for most cases. Periosteal reaction and involucrum indicate infection radiographically. Periostitis without osteomyelitis can be observed with adjacent soft tissue infection, and periostitis with new bone formation can be observed in traumatic induced soft tissue infections. Early radiographic findings can be misleading and often confusing, especially when complicated by preexisting trauma. Chronic osteomyelitis is defined as the presence of bone infection for more than 6 weeks. In the foot, it is most commonly observed in the diabetic population because their compromised immunity and vascular insufficiency predispose them to deep bone infections. Osteomyelitis also can be associated with open fractures, peripehral vascular disease (PVD), immunocompromised hosts, and improper treatment of the acute condition. Chronic osteomyelitis can be either active or inactive. Both states can demonstrate bone destruction, cortical disruption, and sclerosis; thus, they can be difficult to distinguish from a bone tumor. Inactive infection does not harbor viable pathogens within the bone. Thickening of the cortex and resolving osteolysis can be observed and are signs of healing. Several different signs can indicate an active chronic osteomyelitis. Brodie abscess more often is associated with hematogenous spread and is observed on radiographs as a lucent area surrounded by sclerosis and periostitis. The tibia is the most common site of this lesion, but it also can infect the tarsal bones of the foot. Staphylococci are the most common pathogens observed and usually exhibit diminished virulence. On plain films, a Brodie abscess can mimic osteoid osteoma, especially when intracortical. Another sign of active infection on radiographs is the presence of sequestrum. These demonstrate focal areas of sclerosis that can harbor viable pathogens. Periostitis and osteolysis are still observed as well as increased edema in the overlying soft tissue. Patients who are acutely traumatized are at considerable risk for bone infections. Traumatic injuries usually are subject to contamination with skin flora, with the most common one being S aureus. Ubiquitous organisms can include anaerobes associated with farm or soil injuries and other more common gram-positives or gram-negative organisms observed in relatively cleaner situations. A thorough history of the accident helps determine which pathogens to suspect. Infections are the primary cause of instability and nonunion in open fractures. It has been estimated that 70% of open fractures are contaminated at the time of injury. Open fractures in the foot are often observed in persons with crush injuries, individuals involved in motor vehicle and pedestrian accidents, and persons with lawn mower–type injuries. 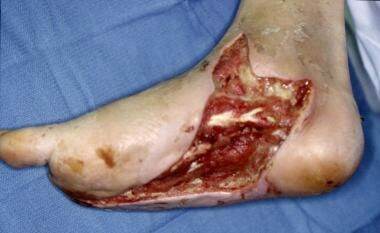 The incidence of osteomyelitis following gunshot wounds to the foot is relatively low. Bullet entry wound. Patient was initially treated conservatively with antibiotics and no surgical debridement. Bullet exit wound 6 months after injury. Chronic drainage from exit site was still occurring. 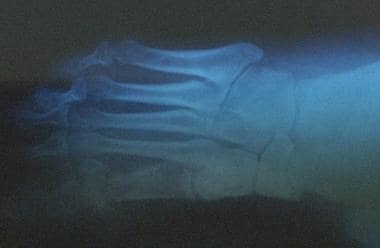 Radiographs of foot demonstrate development of osteomyelitis. Cuboid, anterior portion of calcaneus, base of fifth metatarsal, and base of fourth metatarsal were all involved and required debridement. Lateral view of foot demonstrating osteomyelitis. Foot infection with purulent discharge secondary to open ulceration in diabetic foot. Diabetic peripheral neuropathy has several components involving both somatic and autonomic fibers. Type-A sensory fibers are responsible for light touch sensation, vibratory sensation, pressure, proprioception, and motor innervation to the intrinsic muscles of the foot. The muscles exhibiting early involvement are the flexor digitorum brevis, lumbricals, and interosseous muscles. These groups act to stabilize the proximal phalanx against the metatarsal (MT) head, preventing dorsiflexion at the metatarsophalangeal joint (MTPJ) during midstance in the gait cycle. With progression of the neuropathy, these muscles atrophy and fail to function properly. This causes the MTPJs to become unstable, allowing the long flexors and extensors to act unchecked on the digits. Dorsal contractures develop at the MTPJs with development of hammertoe deformity, also known as intrinsic minus disease. The deformity acts to plantarflex the MTs, making the heads more prominent and increasing the plantar pressure created beneath them. It also acts to decrease the amount of toe weightbearing during the gait cycle, which also increases pressure on the MT heads. Patients are unable to detect increased loads, repeated trauma, or pain from shearing forces. Therefore, injuries such as fractures, ulceration, and foot deformities go unrecognized. Repeat stress to high-pressure areas or bone prominences that would be interpreted as pain in the patient without neuropathy, also go unrecognized. Gait patterns go unchanged, and the stresses eventually cause tissue breakdown and ulceration. The absence of palpable pedal pulses suggests some form of peripheral vascular disease (PVD). Other signs of a more progressive disease state include pallor on elevation, dependent rubor, absence of digital hair, thickened toenails, and slow capillary refill time to the digits. A history of pain in the feet at rest, claudication, impotence, and coronary artery diseases are also markers of vascular disease. Charcot foot disease is known as a neuropathic osteoarthropathy and can be observed in other patients who are neuropathic in addition to patients with diabetes. The exact etiology is still unknown; however, the most common theory involves hyperperfusion of the foot. The autonomic component of the neuropathy leads to vasodilation and hyperperfusion. The perfusion causes demineralization of the bones. Weightbearing forces cause the bones to begin to fragment and fracture, leading to collapse of the arch. The long-term sequelae of a rockerbottom-shaped foot leads to high-pressure areas that are prone to ulceration (see the images below). 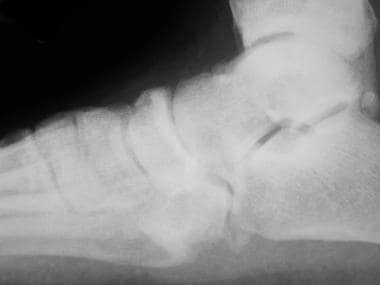 Lateral radiograph of diabetic patient with Charcot foot disease. 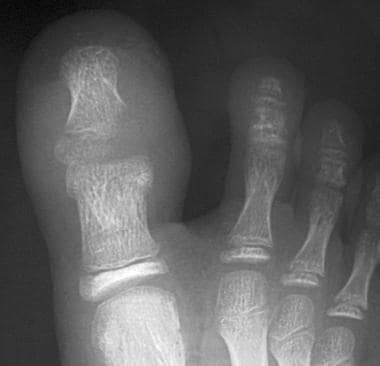 Note midfoot collapse, leaving patient with inverted arch (rockerbottom foot deformity). Ulceration on plantar surface of the foot secondary to high pressures created from Charcot foot deformity. Charcot ulcerations are typically mechanical in nature but can become infected within the soft-tissue and osseous structures. 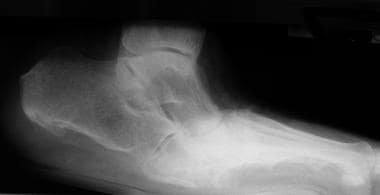 A midfoot collapse with tissue loss and radiographic signs of osteomyelitis in addition to clinical signs of edema and erythema often leads to a confusing and difficult-to-diagnose condition. (See the image below.) 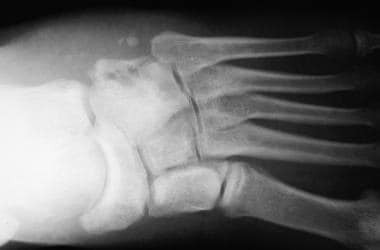 Charcot osteoarthropathies often are diagnosed as osteomyelitis by plain radiographs. Scintigraphic studies help in determining the nature of these changes. Chronic diabetic ulceration with underlying osteomyelitis. Adding to the complexities of diabetic foot infections are the multiple organisms observed in this setting. Diabetic foot infections are typically polymicrobial, with moderate-to-severe infections culturing three to five organisms. Gram-positive and gram-negative organisms, as well as aerobes and anaerobes, are often noted. The most common gram-positive organisms include Enterococcus faecalis, S aureus, S epidermidis, and group B streptococci. Common gram-negative organisms include Proteus species, E coli, Klebsiella species, and Pseudomonas species. Of the anaerobes, Peptococcus species and Bacteroides fragilis are observed most often. Aerobic gram-negative bacilli and anaerobes also are found in addition to the gram-positive cocci but are rarely the sole cause of the infections. Methicillin-resistant S aureus (MRSA) is more prominent in the diabetic population. MRSA does not produce a more severe infection, but the antibiotic selection becomes more limited. It is also not uncommon to see vancomycin-resistant Enterococcus (VRE) species infection. Strict isolation measures must be implemented when these patients are hospitalized. A complete history and thorough physical examination are mandatory first steps toward diagnosing foot infections. A good history reveals several things to the examiner, including time of onset, conditions surrounding the injury, and type of injury. This is important because it provides a good idea of what organisms to expect in the wound. Different bacteria are observed in persons with chronic cellulitis, acute cellulitis, puncture wounds, diabetic wounds, and farm-type injuries. Constitutional symptoms of fever, chills, nausea, or vomiting can indicate septicemia or bacteremia, necessitating a more aggressive treatment plan. Allergies to medications and tetanus status should be elicited if puncture wounds or acute trauma is involved. On examination, local signs of infection include erythema, edema, and increased temperature. Loss of skin wrinkles due to edema is a significant indication of infection and abscess. Open wounds with drainage, purulent discharge, and odor are usually indications of infection. 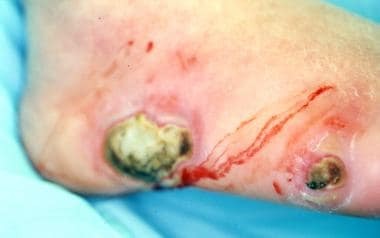 The skin around the lesion should be "milked" toward the ulceration to see if exudate is brought from the deep spaces to the surface through the lesion (see the image below). Foul-smelling drainage is consistent with infections involving anaerobic organisms. Drainage from staphylococcal infections is usually odorless with a creamy yellowish color. Streptococcal infections are also odorless and have a milky yellow-white color. 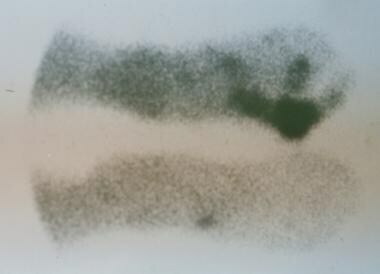 Proteus species infections smell like urea, and pseudomonal infections are green with a fruity putrid odor. Exudate from gram-negative organisms is typically clear. All abscesses and infections of soft tissue and bone should be considered surgical emergencies. Infections of the lower extremities in the presence of vascular insufficiencies require that cellulitis differentiated from dependent rubor by elevation of the extremity (see the image below). These patients often have ischemic ulcers with eschar covering them. The lesions must be palpated for fluctuance under the eschar. If eschar is present, it requires debridement. Fluctuance also can be palpated deep to normal skin, which also requires debridement. 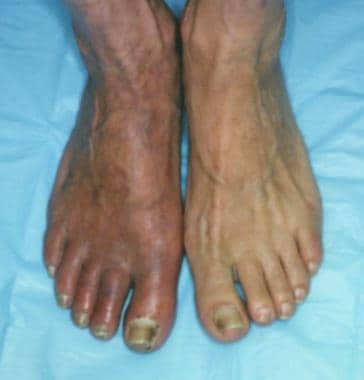 Life-threatening infections such as necrotizing fasciitis and gas gangrene are more common in hosts with vascular compromise and should be considered among the differential diagnoses with a high index of suspicion. 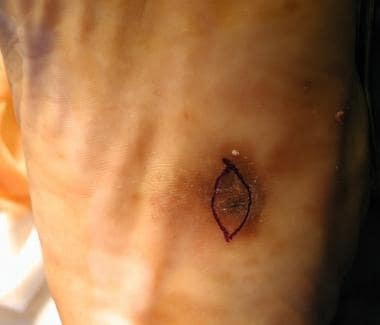 These patients usually have systemic toxemia out of proportion to the degree of the apparent infection, with progressive necrosis of the skin and subcutaneous tissue. Local tissue changes can include minimal suppurative drainage and periwound necrosis. Palpation reveals pain out of proportion to the wound, induration, and, often, crepitus. Pain in the presence of neuropathy is a significant indicator of infection and/or underlying abscess formation. A thorough evaluation of foot infections associated with ulcerations includes probing of the wound. This is important for determining the depth and extent of the lesion. The area should be prepared with povidone-iodine and probed with the wooden end of a sterile cotton-tipped swab or metal probe. Laboratory analysis should include a complete blood count (CBC) with differential, chemistry panel, and coagulation studies. Elevated white blood cell (WBC) count in association with a left shift can be pathognomonic for a systemic infection. It is important to note that many patients with diabetes mellitus (DM) and limb-threatening infections fail to produce a true leukocytosis; therefore, laboratory values can be nonpredictive in this setting. Renal values such as blood urea nitrogen (BUN) and creatinine should be evaluated to establish a baseline prior to initiation of antibiotics, which can be nephrotoxic. Many individuals who are diabetic have chronic renal insufficiency or end-stage renal disease for which antibiotic dosing needs to be very specific. Patients with renal diabetes are often anemic and require epoetin alfa or transfusions prior to surgery because blood loss can initiate or potentiate a cardiac event, especially in this population with global vascular diseases. Coagulation studies are important if the patient is going to surgery for irrigation and debridement. Patients with peripheral vascular disease (PVD) often have foot infections. Coronary artery disease and atrial fibrillation necessitate anticoagulation with warfarin; therefore, prothrombin time (PT) and international normalized ratio (INR) values are important prior to surgery. Fresh frozen plasma (FFP) and vitamin K can be given prior to debridement if the INR is too high. Other useful lab studies are C-reactive protein (CRP) and erythrocyte sedimentation rate (ESR). CRP is an inflammatory marker that is usually elevated in the presence of a bone infection and provides a good gauge of treatment efficacy. ESR is another inflammatory marker that indicates an infectious or reactive process and is useful for evaluating response to antibiotics. Albumin levels should be checked when malnutrition is suspected and can pose a problem for wound healing if too low. Radiolucent objects such as plastic, rubber, and wood are not often observed on radiographs and require ultrasonographic identification. The most important reason for ordering plain films, especially with infected diabetic ulcers, is to exclude gas in the soft tissues. Again, this represents an emergency situation and must be treated aggressively with surgical decompression. Plain radiographs can be useful in the evaluation of osteomyelitis (see the images below). The initial manifestations of osteomyelitis occur as pathogens invade the periosteum via direct extension. This causes the periosteum to be lifted and periosteal new bone formation to occur. The progression of the infectious process results in cortical disruption and medullary involvement. Simple radiographs lack sensitivity and specificity with respect to early detection of osteomyelitis. Bone destruction and periostitis are usually not detectable for up to 2 weeks after the initiation of infection. Chronic diabetic ulceration with underlying osteomyelitis. Plain film exhibits cortical disruption at medial aspect of first metatarsophalangeal joint. Plain films identify periosteal reaction, cortical disruption, Brodie metaphyseal abscess, sequestrum, and involucrum. Radiographs are often more helpful with long-term bone infection during which overt bone changes are noted. Another useful and cost-effective radiologic modality used with foot infection is the ultrasound examination. This study is very helpful in looking at retained foreign bodies not observed on plain films and in looking for soft-tissue abscesses, but its reliability tends to be highly operator-dependent. Radiopaque foreign bodies such as wood and plastic can be identified by means of ultrasonography. Abscesses are observed as complex and typically cystic structures containing internal echogenicity with through transmission. The echogenicity varies, depending on the contents of the abscess. Ultrasonography is particularly useful in the foot because it can help identify the exact location of the abscess within the many deep compartments and fascial structures. Technetium-99m methylene diphosphonate (MDP), when used in a three-phase bone scan, can reveal infection 24-48 hours after the clinical onset (see the images below). Three-phase bone scans assist in distinguishing cellulitis from osteomyelitis. Increased uptake of the scintigraphic tracer during the early phases of a three-phase bone scan with little or no increase in uptake during the late phase is indicative of soft-tissue infection without bone involvement. Uptake in all three phases is observed in persons with osteomyelitis. Chronic diabetic ulceration with underlying osteomyelitis. 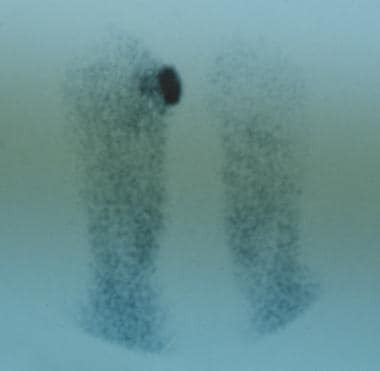 Standard technetium Tc99m methylene diphosphonate (MDP) bone scan, late-phase image. Chronic diabetic ulceration with underlying osteomyelitis. Technetium Tc99m methylene diphosphonate (MDP) hexamethylpropylamine oxime (HMPAO) leukocyte-labeled scan of same region. This demonstrates more specific uptake pattern, which is helpful in surgical planning. This test is typically very sensitive but not specific, because increased uptake of tracer can be observed with several other conditions, including bone tumors and Charcot osteoarthropathy, and following trauma or surgery. The results must be interpreted in conjunction with clinical findings and other diagnostic modalities. Gallium-67 can be used in conjunction with technetium-99m to increase the overall specificity of the study. Gallium accumulates in infected bone, making it a useful tracer. Although specificity is increased, false-positive results still occur because it can accumulate in infected soft tissue, hematomas, some tumors, and areas of increased bone turnover (osteoarthropathy, fracture, and postsurgery). False-negative results also may occur with this tracer when patients are taking antibiotics. Leukocyte-labeled indium-111 reveals infection at an earlier stage than technetium-99m MDP alone and is both sensitive and specific. It is often combined with technetium-99m MDP to increase the sensitivity and specificity further. Although this scan has many attributes, several problems also exist. Indium-111 uses polymorphonuclear leukocytes (PMNs) and not lymphocytes; accordingly, it is not as sensitive for detecting chronic osteomyelitis. Because it has a low spatial resolution, differentiation from other soft-tissue infections is difficult. It is a time-consuming examination, requiring 3 days to complete. Finally, it is more expensive than magnetic resonance imaging (MRI). Another nuclear medicine study uses leukocyte-labeled technetium-99m hexamethylpropylamine oxime (HMPAO). This offers a more cost-effective alternative to the indium-111 labeled scan. The biodistribution and function are very similar to those of indium-111, with the benefit of a more favorable radiation dosimetry, allowing a larger dose of radioactivity to be administered with less systemic absorption. This provides a larger amount of local activity and faciliattes interpretation of the structures involved. The test is completed in 3-4 hours rather than 3 days. HMPAO has many uses but proves to be invaluable in patients in two specific situations: the postoperative patient and the patient with recent fracture in whom osteomyelitis is suspected. Healing bone following surgery or fracture lights up on technetium-99m MDP 1-2 years after the incident. If osteomyelitis is suspected at a recent surgical site, differentiating the two with conventional technetium-99m MDP scintigraphy is not possible. However, technetium-99m HMPAO scans are more specific for the infectious process. Computed tomography (CT) is beneficial for diagnosing both soft-tissue and bone infections in the foot. It is very useful for detecting small areas of osteolysis in cortical bone, small foci of gas, and small foreign bodies that may be associated with infection. Abscesses are observed as fluid collections displaying walls of various thicknesses. Edema and cellulitis are observed as mild enhancements in the soft tissue with thickening of the fascia. Gas in the deep tissues associated with gas gangrene or necrotizing fascitis is displayed readily on CT, exhibiting the seriousness of the infection. CT is an imaging method with high spatial resolution that provides great detail of cortical bone in a cross-sectional display. For this reason, it is excellent for picking up cortical disruptions or changes in bone associated with osteomyelitis. On CT, sequestra appear as fragments of dense bone often surrounded by increased soft-tissue or fluid density. It can depict increased intraosseous density, reflecting the accumulation of pus that replaces the fat in the marrow. Involucra and sequestra are also readily detectable with CT. Because of its great detail, CT works well for identifying subtle changes within the intricate soft-tissue layers and bones of the foot. The most advanced radiologic study used in foot infections is MRI. This is ideal for identifying lesions within soft tissues and works well for detecting changes taking place within bones. MRI proves to be very sensitive in determining the presence and extent of inflammation. Because of this, it is helpful in delineating whether an infection is limited to soft tissue, joints, or bones or whether several structures are involved. This is beneficial for treatment given the complex anatomy of the foot. Viable tissue also is differentiated readily from necrotic tissue, which aids in surgical planning and helps preserve the viability of adjacent healthy tissues during debridement. However, it should be understood that MRIs tend to overrepresent the amount of involved tissue, especially bone. This must be taken into account when MRI is used to help plan surgical debridement. MRI provides an accurate visual image of soft tissue, joint spaces, tendon sheaths, and fascial planes, making it ideal for use in diagnosing or studying the extent of infectious processes or abscesses within these structures. It has the advantage of being able to demonstrate an abscess in any plane and can better delineate the extent of adjacent soft tissue changes when compared with other studies such as CT. The use of MRI to assist in diagnosing osteomyelitis continues to gain popularity. One study demonstrated MRI to be significantly more sensitive and accurate, with equal specificity in comparison with plain radiographs, technetium-99m MDP, and gallium-67 scans. The sensitivity of MRI for diagnosis of early osteomyelitis stems from its ability to differentiate normal bone marrow from abnormal bone marrow. With bone infection, marrow is replaced by fluid and inflammatory cells, which are displayed as regions of reduced signal intensity on T1-weighted images and as increased signal intensity on T2-weighted images and short tau inversion recovery (STIR) sequences. Other changes displayed include erosions and perforations of the cortex, periosteal new bone formation, and soft tissue edema. Although highly sensitive, MRI remains less specific because several disorders, including diabetic osteoarthropathy, can produce similar abnormalities in signal intensity. When present, secondary signs of infection, such as cellulitis, sinus tract formation from skin to bone, cortical disruption, and sequestrum formation, need to be looked for to rule in osteomyelitis. However, MRI is an excellent study for evaluating bone infections overall. Many factors can complicate the treatment of foot infections. Patients who are immunocompromised and those with peripheral vascular, metabolic, or biomechanical defects can have complicated courses that lead to delayed healing time. When conservative and noninvasive treatment measures fail to resolve foot infections, surgical intervention is required. Infections often stem from chronic ulcerations in the feet. To achieve the final goals of a functional foot that is free from infections and will not succumb to further breakdown, it is frequently necessary to consult various surgical specialists. Foot ulcerations are commonly associated with decreased perfusion to the lower extremity. Peripheral vascular surgeons or interventional radiologists should be consulted for aggressive revascularization or other interventions to increase perfusion and optimize healing. Plastic surgeons are also important when skin grafting, local, or free tissue flaps are needed for final coverage of defects. Pharmacologic advances and newer reconstructive techniques have changed the way physicians treat infected lower extremities. Treatment goals today are directed toward limb salvage and restoration of function while decreasing major amputation rates. Treatment options vary, depending on the type of foot infection present. Mild superficial infections and simple cellulitis usually are treated on an outpatient basis with oral antibiotics. The patient is encouraged to decrease activities and keep the extremity elevated until the infection resolves. Antibiotics should be administered for 7-10 days and are directed toward the most common organisms, including S aureus, S epidermidis, and Streptococcus species. The most frequently used medications for foot infections are first-generation cephalosporins, clindamycin (for patients allergic to penicillin), amoxicillin-clavulanate, and levofloxacin. Antibiotics active against methicillin-resistant S aureus (MRSA) should be considered in those with increased risk factors. In the setting of mild foot infections associated with open lesions or ulcerations, local wound care is used in addition to antimicrobial medications. Various dressing types are available and should be chosen according to the characteristics of the lesion. The goals are to provide a moist wound environment, encourage drainage, avoid build-up of necrotic tissue, and keep the bacterial count low. The most commonly used dressing is the wet-to-dry dressing. Gauze moistened with isotonic sodium chloride solution is placed in the wound and covered by dry gauze. The dressing maintains a moist environment, wicks away drainage, and debrides necrotic tissue. It works well in stable wounds and encourages granulation. For treating more aggressive wounds, a topical antimicrobial agent can be used. Several newer dressings work very well for wounds with large amounts of drainage. Different foam dressings exist that absorb large amounts of exudate without macerating the surrounding tissues. Occlusive dressings work well to create a moist environment, but they are not recommended unless the wound is very clean, because they can become an excellent medium for bacteria to proliferate. Another option is the vacuum-assisted closure (VAC) device, which is a continuous suction device placed directly on the wound. An open cell sponge with a vacuum hose attached is placed within the wound and covered with an occlusive dressing. Fluid from the wound is removed immediately, and surrounding edema is diminished. This approach decreases the bacterial count significantly and encourages the development of granulation tissue. The VAC device works well as an adjunct after debridement of a wound. In penicillin-allergic patients, IV clindamycin in combination with oral ciprofloxacin, levofloxacin, or gatifloxacin may be used. These oral medications are mentioned because they are more cost-effective and have the same absorption into bone as the IV versions. Wounds that are suspected of containing very aggressive gram-negative organisms should be covered additionally with an aminoglycoside. Once culture and sensitivities from a deep intraoperative swab return, antimicrobial therapy can be changed to a more specific medication. However, if the patient is responding well to the current regimen, a change of agent may not be necessary. In situations where a patient is not responding, an infectious disease consultation is highly recommended. MRSA is common, especially in persons with chronic wounds and in patients who are diabetic. MRSA is present in as many as 25% of diabetic foot infections involving S aureus. MRSA is more common in patients who have been on prolonged ciprofloxacin therapy, have recently stayed in a healthcare facility, or have been colonized in the past. Often, MRSA only colonizes the superficial surface of the ulceration and should not be treated as the infectious agent; however, when it does become the infectious agent, it must be treated aggressively. A limited number of antibiotics are indicated for the treatment of MRSA. The drug of choice is IV vancomycin. Newer medications for MRSA and other resistant bacteria include quinupristin-dalfopristin and linezolid [74, 75] ; however, these are not yet first-line agents and should be reserved for very resistant strains. These wounds can be thought of as tumors and excised completely until only normal tissue remains. To accomplish this, serial debridements are often required because determining the viability of tissue early in the infection is difficult. The surgical site is left open, and local wound care is provided along with appropriate antibiotics. Lines of demarcation are allowed to form between healthy and nonviable tissues for 2-3 days before the patient is taken back to surgery for further debridement. This procedure may have to be repeated several times before the wound is converted to a healthy one that is free of necrotic material (see the images below). Necrotic and devitalized tissues must be removed because they provide a favorable environment for bacterial growth. More aggressive infections (eg, necrotizing fasciitis) may require debridements every 1-2 days. Once the infection resolves, reconstruction of the foot can begin. Infected diabetic ulceration prior to debridement. Note cellulitis extending up to ankle and edema within arch. Infected diabetic ulceration. Intraoperative view demonstrates extensive myonecrosis and purulent drainage. Infected diabetic ulceration. Shown is clean wound bed after several debridements, intravenous antibiotics, and local wound care. Surgical reconstruction of foot can now begin. The first layer of tissue encountered during surgery is the skin. An incision is made at the border where healthy tissue meets nonviable tissue. 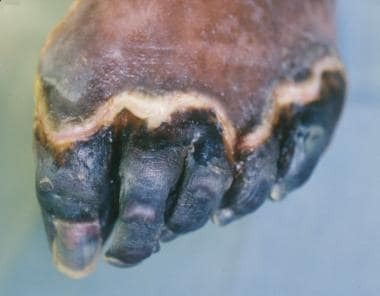 This border can be clearly demarcated, as in individuals with dry gangrene (see the image below), or it can be more obscure, which is the more common scenario. If the lines of demarcation are not obvious, the best way to differentiate between viable and nonviable tissue is to look for bleeding margins. The margins of healthy tissue actively bleed when an incision is made. The incision is created in the center of the questionable area, and the skin is removed in concentric circles until bleeding edges are encountered. Only when normal bleeding is encountered at the fresh skin edges can the physician be certain that the nonviable tissue has been removed. The subcutaneous tissue layer consists mostly of fat but also contains nerves and blood vessels. Fat is relatively avascular as compared with surrounding tissues; thus, active bleeding is not the best indicator for determining its viability. Healthy fat feels soft, is resilient, and has a shiny yellow color. In contrast, nonviable fat feels hard, is nonpliable, and has a gray-white coloration. Healthy nerves are white and shiny and should be spared if possible. Caution should be used to ensure that retained nerves do not become entrapped in granulation or scar tissue and that adequate soft-tissue coverage is created during reconstruction to avoid painful neurapraxia. When nerves must be sacrificed, neuroma formation can be minimized by sewing the epineurium at the cut end together with 8-0 sutures or by implanting the cut end of the nerve into muscle or bone. Blood vessels that are to be removed should be cauterized at the open ends or tied off when appropriate. Deep structures in the foot include tendon, tendon sheaths, muscle, bone, and the fascia that divides them into different planes. When debridement reaches these deep structures, careful planning is needed because foot function is altered. The surgeon should concentrate not only on removing all nonviable tissue but also on developing a medical care plan for the reconstruction and eventual long-term functionality of the foot. Healthy tendon is white and shiny, whereas infected tendon is dull, soft, and stringy and can be in the process of liquefying. Normal muscle is beefy red and bleeds when cut. Dead muscle tends to be dull, dark, and falls apart easily when handled. An effective test for determining muscle viability is to pinch it with an instrument or stimulate it with the Bovie electrocautery device; muscle that is still viable contracts. Infected bone is soft and does not bleed when cut. As with the other tissues, nonviable bone should be excised until a healthy bleeding margin is obtained. An additional small portion of what is deemed to be healthy bone should be removed and sent for culture and pathologic examination to ensure that all osteomyelitic tissue has been removed. Once the infection completely resolves and the wound is converted to healthy tissue, the often-difficult task of foot reconstruction begins. The goal is to create a functional foot that resists future breakdown and infection (see the images below). A multidisciplinary team approach is used to achieve the best results. Peripheral vascular, podiatric, plastic, and orthopedic surgeons should be involved along with nonsurgical specialties for management of the complex nutritional, cardiovascular, endocrine, renal, and pulmonary issues that often arise in these cases. Open ulceration in diabetic foot after infection has resolved. Reconstructive surgery can now begin. Patient underwent previous hallux amputation for separate infection. Reconstructive surgery of diabetic foot after infection has resolved. Patient underwent previous hallux amputation for separate infection. Delayed primary closure via creation of local rotational flap of tissue for coverage. Reconstructive surgery of diabetic foot after infection has resolved. Patient underwent previous hallux amputation for separate infection. Local rotational flap of tissue was retained for coverage. More than 2 months postoperatively, lesion is completely closed without complication. Fry DE, Marek JM, Langsfeld M. Nonoperative Management of Lower Extremity Arterial Disease, Part 1: Infections in the Ischemic Lower Extremity. Surg Clin North Am. 1998. 78:466. Hill MK, Sanders CV. Skin and soft tissue infections in critical care. Crit Care Clin. 1998 Apr. 14(2):251-62. [Medline]. Bowler PG, Duerden BI, Armstrong DG. Wound microbiology and associated approaches to wound management. Clin Microbiol Rev. 2001 Apr. 14(2):244-69. [Medline]. Wukich DK, Sung W. Charcot arthropathy of the foot and ankle: modern concepts and management review. J Diabetes Complications. 2009 Nov-Dec. 23 (6):409-26. [Medline]. Smith SC, Bazzoli C, Chung I, Johnson A, Martin DR. Antimicrobial susceptibility of Escherichia coli in uncomplicated cystitis in the emergency department: is the hospital antibiogram an effective treatment guide?. Acad Emerg Med. 2015 Aug. 22 (8):998-1000. [Medline]. Joshi S. Hospital antibiogram: a necessity. Indian J Med Microbiol. 2010 Oct-Dec. 28 (4):277-80. [Medline]. Joseph WS, Kosinski MA. Prophylaxis in lower-extremity infectious diseases. Clin Podiatr Med Surg. 1996 Oct. 13(4):647-60. [Medline]. Habif TP. Clinical Dermatology: A Color Guide to Diagnosis and Therapy. 3rd ed. Mosby-Year Book. 1995:763. Deery HG 2nd. Outpatient parenteral anti-infective therapy for skin and soft-tissue infections. Infect Dis Clin North Am. 1998 Dec. 12(4):935-49, vii. [Medline]. Baldwin G, Colbourne M. Puncture wounds. Pediatr Rev. 1999 Jan. 20(1):21-3. [Medline]. Patzakis MJ, Wilkins J, Brien WW, Carter VS. Wound site as a predictor of complications following deep nail punctures to the foot. West J Med. 1989 May. 150(5):545-7. [Medline]. Lavery LA, Armstrong DG, Quebedeaux TL, Walker SC. Puncture wounds: normal laboratory values in the face of severe infection in diabetics and non-diabetics. Am J Med. 1996 Nov. 101(5):521-5. [Medline]. Laughlin RT, Reeve F, Wright DG. Calcaneal Osteomyelitis Caused by Nail Puncture Wounds. Foot and Ankle Inernational. 1997. 9:575-577. Steele MT, Tran LV, Watson WA, Muelleman RL. Retained glass foreign bodies in wounds: predictive value of wound characteristics, patient perception, and wound exploration. Am J Emerg Med. 1998 Nov. 16(7):627-30. [Medline]. Manthey DE, Storrow AB, Milbourn JM, Wagner BJ. Ultrasound versus radiography in the detection of soft-tissue foreign bodies. Ann Emerg Med. 1996 Jul. 28(1):7-9. [Medline]. Barbosa P. Plantar verrucae and HIV infection. Clin Podiatr Med Surg. 1998 Apr. 15(2):317-27. [Medline]. Cunha BA. Infections in nonleukopenic compromised hosts (diabetes mellitus, SLE, steroids, and asplenia) in critical care. Crit Care Clin. 1998 Apr. 14(2):263-82. [Medline]. Anderson RJ. Rheumatoid arthritis: epidemiology, pathology, and pathogenesis. In: Klippel JH, Crofford L, Stone JH, et al, eds. Primer on the Rheumatic Diseases. 11 ed. Arthritis Foundation. 1997:164. Clemens MW, Parikh P, Hall MM, Attinger CE. External fixators as an adjunct to wound healing. Foot Ankle Clin. 2008 Mar. 13(1):145-56. [Medline]. Warkentin TE. Ischemic Limb Gangrene with Pulses. N Engl J Med. 2015 Aug 13. 373 (7):642-55. [Medline]. Brucato MP, Patel K, Mgbako O. Diagnosis of gas gangrene: does a discrepancy exist between the published data and practice. J Foot Ankle Surg. 2014 Mar-Apr. 53 (2):137-40. [Medline]. Hoover TJ, Siefert JA. Soft tissue complications of orthopedic emergencies. Emerg Med Clin North Am. 2000 Feb. 18(1):115-39, vi. [Medline]. Revathi G, Puri J, Jain BK. Bacteriology of burns. Burns. 1998 Jun. 24(4):347-9. [Medline]. Marone P, Monzillo V, Perversi L, Carretto E. Comparative in vitro activity of silver sulfadiazine, alone and in combination with cerium nitrate, against staphylococci and gram- negative bacteria. J Chemother. 1998 Feb. 10(1):17-21. [Medline]. Oloff LM, Schulhofer SD. Osteomyelitis. McGlamry's Comprehensive Textbook of Foot and Ankle Surgery. 2001. 2:2017-2049. Fackler ML. Gunshot wound review. Ann Emerg Med. 1996 Aug. 28(2):194-203. [Medline]. Thoresby FP, Darlow HM. The mechanisms of primary infection of bullet wounds. Br J Surg. 1967 May. 54(5):359-61. [Medline]. Boucree JB Jr, Gabriel RA, Lezine-Hanna JT. Gunshot wounds to the foot. Orthop Clin North Am. 1995 Jan. 26(1):191-7. [Medline]. Anger DM, Ledbetter BR, Stasikelis PJ. Injuries of the foot related to the use of lawn mowers. J Bone Joint Surg Am. 1995 May. 77(5):719-25. [Medline]. Elliott DC, Kufera JA, Myers RA. Necrotizing soft tissue infections. Risk factors for mortality and strategies for management. Ann Surg. 1996 Nov. 224(5):672-83. [Medline]. Misiakos EP, Bagias G, Patapis P, Sotiropoulos D, Kanavidis P, Machairas A. Current concepts in the management of necrotizing fasciitis. Front Surg. 2014. 1:36. [Medline]. Rabinowitz RP, Caplan ES. Management of infections in the trauma patient. Surg Clin North Am. 1999 Dec. 79(6):1373-83, x. [Medline]. DeHaven KE, Evarts CM. The continuing problem of gas gangrene: a review and report of illustrative cases. J Trauma. 1971 Dec. 11(12):983-91. [Medline]. VanUnik AJ. Inhibition of Toxin Production in Clostridium perfringens In-Vitro by Hyberbaric Oxygen. J Microbial Serol. 1965. 31:181. Faglia E, Favales F, Aldeghi A, et al. Adjunctive systemic hyperbaric oxygen therapy in treatment of severe prevalently ischemic diabetic foot ulcer. A randomized study. Diabetes Care. 1996 Dec. 19(12):1338-43. [Medline]. Hammarlund C, Sundberg T. Hyperbaric oxygen reduced size of chronic leg ulcers: a randomized double-blind study. Plast Reconstr Surg. 1994 Apr. 93(4):829-33; discussion 834. [Medline]. Jeffcoate WJ, Lipsky BA. Controversies in diagnosing and managing osteomyelitis of the foot in diabetes. Clin Infect Dis. 2004 Aug 1. 39 Suppl 2:S115-22. [Medline]. Shimose S, Sugita T, Kubo T, Matsuo T, Nobuto H, Ochi M. Differential diagnosis between osteomyelitis and bone tumors. Acta Radiol. 2008 Oct. 49 (8):928-33. [Medline]. Antrum RM, Solomkin JS. A review of antibiotic prophylaxis for open fractures. Orthop Rev. 1987 Apr. 16(4):246-54. [Medline]. Gustillo RB, Merklow RL, Templeman D. The Management of Open Fractures. J Bone J Surg. 1990. 72:51. Steele PM, Bush-Joseph C, Bach B. Office management of trauma: management of acute fractures around the knee, ankle, and foot. In: Clinics in Family Practice. Vol 2. 2000. Durham JR, Lukens ML, Campanini DS, et al. Impact of magnetic resonance imaging on the management of diabetic foot infections. Am J Surg. 1991 Aug. 162(2):150-3; discussion 153-4. [Medline]. Gibbons GW, Eliopoulous GN. Infection of the diabetic foot. In: Ozak GP, Campell D, Hoar CS, et al. Management of Diabetic Foot Problems. Philidelphia:. WB Saunders Co. 1984:97. Nather A, Bee CS, Huak CY, Chew JL, Lin CB, Neo S. Epidemiology of diabetic foot problems and predictive factors for limb loss. J Diabetes Complications. 2008 Mar-Apr. 22(2):77-82. [Medline]. Chellan G, Neethu K, Varma AK, Mangalanandan TS, Shashikala S, Dinesh KR, et al. Targeted treatment of invasive fungal infections accelerates healing of foot wounds in patients with Type 2 diabetes. Diabet Med. 2012 Jan 16. [Medline]. [Guideline] Lipsky BA, Peters EJ, Berendt AR, Senneville E, Bakker K, Embil JM, et al. Specific guidelines for the treatment of diabetic foot infections 2011. Diabetes Metab Res Rev. 2012 Feb. 28 Suppl 1:234-5. [Medline]. Lipsky BA, Peters EJ, Senneville E, Berendt AR, Embil JM, Lavery LA, et al. Expert opinion on the management of infections in the diabetic foot. Diabetes Metab Res Rev. 2012 Feb. 28 Suppl 1:163-78. [Medline]. Sumpio BE. Foot ulcers. N Engl J Med. 2000 Sep 14. 343(11):787-93. [Medline]. Levin ME. Preventing amputation in the patient with diabetes. Diabetes Care. 1995 Oct. 18(10):1383-94. [Medline]. Saltzman CL, Pedowitz WJ. Diabetic foot infection. In: AAOS Instructional Course Lectures. Vol 48. 1999:317. Kamal K, Powell RJ, Sumpio BE. The pathobiology of diabetes mellitus: implications for surgeons. J Am Coll Surg. 1996 Sep. 183(3):271-89. [Medline]. Butalia S, Palda VA, Sargeant RJ, Detsky AS, Mourad O. Does this patient with diabetes have osteomyelitis of the lower extremity?. JAMA. 2008 Feb 20. 299(7):806-13. [Medline]. Frykberg RG, Veves A. Diabetic foot infections. Diabetes Metab Rev. 1996 Oct. 12(3):255-70. [Medline]. Brunner UV, Hafner J. Diabetic foot infection. Curr Probl Dermatol. 1999. 27:252-8. [Medline]. Yates CJ, May K, Hale T, Allard B, Rowlings N, Freeman A, et al. Wound chronicity, inpatient care and chronic kidney disease predispose to MRSA infection in diabetic foot ulcers. Diabetes Care. 2009 Jul 8. [Medline]. [Full Text]. Grayson ML, Gibbons GW, Balogh K, et al. Probing to bone in infected pedal ulcers. A clinical sign of underlying osteomyelitis in diabetic patients. JAMA. 1995 Mar 1. 273(9):721-3. [Medline]. Lipsky BA, Polis AB, Lantz KC, Norquist JM, Abramson MA. The value of a wound score for diabetic foot infections in predicting treatment outcome: A prospective analysis from the SIDESTEP trial. Wound Repair Regen. 2009 Aug 11. [Medline]. Perry CR, Pearson RL, Miller GA. Accuracy of cultures of material from swabbing of the superficial aspect of the wound and needle biopsy in the preoperative assessment of osteomyelitis. J Bone Joint Surg Am. 1991 Jun. 73(5):745-9. [Medline]. Boutin RD, Brossmann J, Sartoris DJ, et al. Update on imaging of orthopedic infections. Orthop Clin North Am. 1998 Jan. 29(1):41-66. [Medline]. Struk DW, Munk PL, Lee MJ, et al. Imaging of soft tissue infections. Radiol Clin North Am. 2001 Mar. 39(2):277-303. [Medline]. Blume PA, Dey HM, Daley LJ, et al. Diagnosis of pedal osteomyelitis with Tc-99m HMPAO labeled leukocytes. J Foot Ankle Surg. 1997 Mar-Apr. 36(2):120-6; discussion 160. [Medline]. Filippi L, Uccioli L, Giurato L, Schillaci O. Diabetic foot infection: usefulness of SPECT/CT for 99mTc-HMPAO-labeled leukocyte imaging. J Nucl Med. 2009 Jul. 50(7):1042-6. [Medline]. Cook TA, Rahim N, Simpson HC, Galland RB. Magnetic resonance imaging in the management of diabetic foot infection. Br J Surg. 1996 Feb. 83(2):245-8. [Medline]. Croll SD, Nicholas GG, Osborne MA, Wasser TE, Jones S. Role of magnetic resonance imaging in the diagnosis of osteomyelitis in diabetic foot infections. J Vasc Surg. 1996 Aug. 24(2):266-70. [Medline]. Weinstein D, Wang A, Chambers R, et al. Evaluation of magnetic resonance imaging in the diagnosis of osteomyelitis in diabetic foot infections. Foot Ankle. 1993 Jan. 14(1):18-22. [Medline]. Mader JT, Ortiz M, Calhoun JH. Update on the diagnosis and management of osteomyelitis. Clin Podiatr Med Surg. 1996 Oct. 13(4):701-24. [Medline]. Cunha BA. Antibiotic selection for diabetic foot infections: a review. J Foot Ankle Surg. 2000 Jul-Aug. 39(4):253-7. [Medline]. Day MR, Armstrong DG. Factors associated with methicillin resistance in diabetic foot infections. J Foot Ankle Surg. 1997 Jul-Aug. 36(4):322-5; discussion 331. [Medline]. Tascini C, Gemignani G, Palumbo F, Leonildi A, Tedeschi A, Lambelet P, et al. Clinical and microbiological efficacy of colistin therapy alone or in combination as treatment for multidrug resistant Pseudomonas aeruginosa diabetic foot infections with or without osteomyelitis. J Chemother. 2006 Dec. 18(6):648-51. [Medline]. Omar NS, El-Nahas MR, Gray J. Novel antibiotics for the management of diabetic foot infections. Int J Antimicrob Agents. 2007 Dec 21. [Medline]. Noe JM, Kalish S. The problem of adherence in dressed wounds. Surg Gynecol Obstet. 1978 Aug. 147(2):185-8. [Medline]. Mertz PM, Oliveira-Gandia MF, Davis SC. The evaluation of a cadexomer iodine wound dressing on methicillin resistant Staphylococcus aureus (MRSA) in acute wounds. Dermatol Surg. 1999 Feb. 25(2):89-93. [Medline]. Armstrong DG, Lanthier J, Lelievre P, et al. Methicillin-resistant coagulase-negative staphylococcal osteomyelitis and its relationship to broad-spectrum oral antibiosis in a predominantly diabetic population. J Foot Ankle Surg. 1995 Nov-Dec. 34(6):563-6. [Medline]. Norrby R. Linezolid - a review of the first oxazolidinone. Expert Opin Pharmacother. 2001 Feb. 2(2):293-302. [Medline]. Li Z, Willke RJ, Pinto LA, et al. Comparison of length of hospital stay for patients with known or suspected methicillin-resistant Staphylococcus species infections treated with linezolid or vancomycin: a randomized, multicenter trial. Pharmacotherapy. 2001 Mar. 21(3):263-74. [Medline]. Attinger CE, Bulan E, Blume PA. Surgical debridement. The key to successful wound healing and reconstruction. Clin Podiatr Med Surg. 2000 Oct. 17(4):599-630. [Medline]. Cuttica DJ, Philbin TM. Surgery for diabetic foot infections. Foot Ankle Clin. 2010 Sep. 15(3):465-76. [Medline]. Wallace GF. Debridement of invasive diabetic foot infections. Clin Plast Surg. 2007 Oct. 34(4):731-4. [Medline]. Cellulitis extending to level of ankle joint secondary to infected ulceration plantar to fifth metatarsal head. Permanent marker is used to define proximal extent of cellulitis to determine if condition is improving or worsening with therapy. Disclosure: Serve(d) as a director, officer, partner, employee, advisor, consultant or trustee for: Society of Military Orthopaedic Surgeons; American Academy of Orthopaedic Surgeons; American College of Surgeons; American Orthopaedic Association<br/>Received research grant from: Congressionally Directed Medical Research Program<br/>Received income in an amount equal to or greater than $250 from: Nexus Medical Consulting; Pacira Pharmaceuticals, Inc.